Ever since I saw the new Lancome nail polish line, I've been dying to try them. Today I have 4 of them for review and please believe me I've had a really hard time picking them! Gris Angora (407N) is a gorgeous grey creme with a strong purple tint. Rather light, almost pastel but not quite, I don't think I could express just how much I love it : pure grey perfection! Aquamarine (501B) is a beautiful turquoise creme. 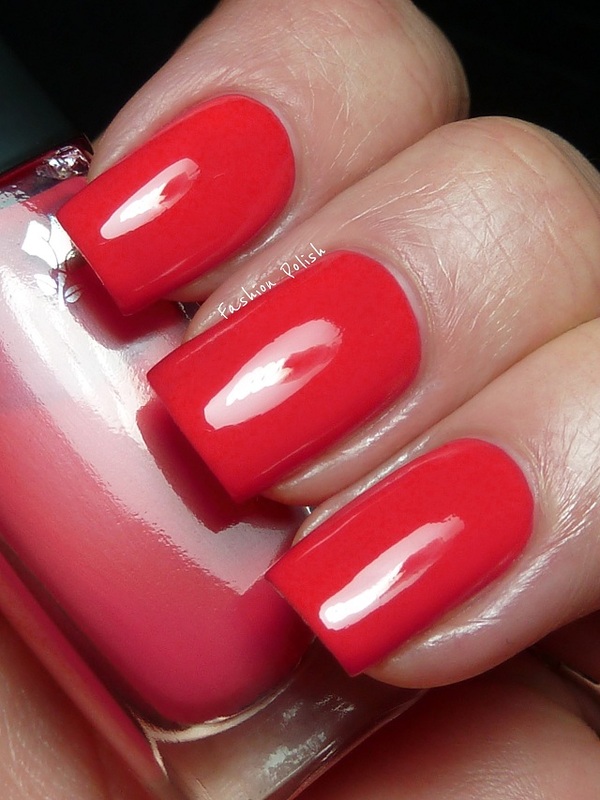 Again, I'm totally in love with it and although it's not the most original shade, I couldn't have passed it. 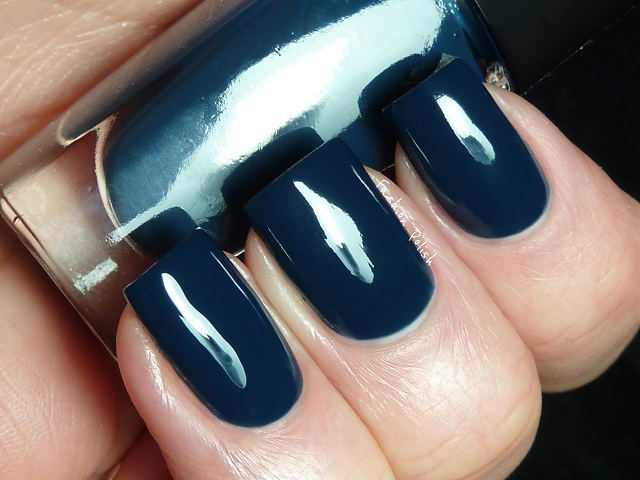 Bleu de Flore (573B) is a dark midnight blue creme, not so dark that it looks black, even under low lighting. With a faint dustiness, it's such a classy shade! Rouge in Love (112B) was a nighmare to photograph. 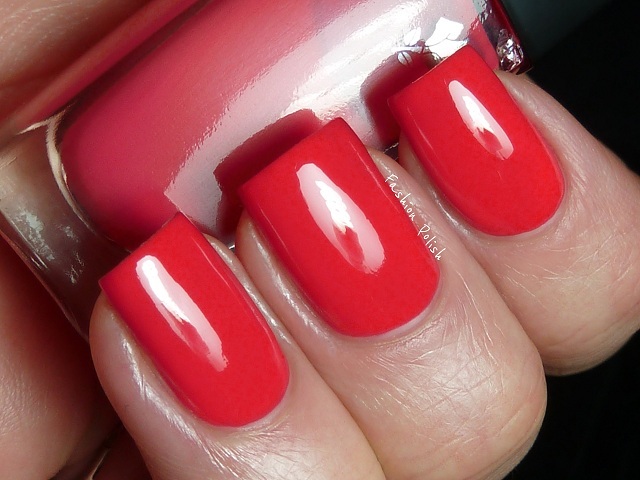 It's very similar to OPI Red Lights Ahead…Where?, slightly coral, dusty and yet saturated. Very complimenting on the nails. All these shades applied like butter. Actually they were pure perfection formula wise : smooth, fluid and pigmented, they were all almost one coaters and dried to a glossy finish (no topcoat in the swatches). 24 new shades and a brand new wider brush (think Dior but synthetic and flat), for the easiest application ever... Maybe I should get a few more... Don't you think? Lancome products can be purchased at your local beauty counter or online on : Lancome.fr in France, Lancome.co.uk in the UK or Lancome-usa.com in the US. Nothing at all unique in these. But have to say, I do miss having a dept store close by. We lost ours with the recession very early and now it's a 2 hr drive to another dept store that has Lancone. I never bought that many polishes - but the ones from Lancone I have, I like a lot. Bleu de Flore really stands out to me. It's rare to see a navy be so dusty! Plus, it looks lovely on you! I'm always visiting your blog but I never leave a comment ... I am ashamed! Anyway, I got a nailpolish of Lancôme that my friend brought the UK and just loved it. Too bad I can not find so easy the polish that mark here in Brazil. Oh man. Why did you have to tell me that Lancome has new polishes! I only have one (Indigo Paris) and I love it. Now I'm going to have to snag a few of these. That turquoise is divine! You kill me with your swatches!! I want all of these! I don't know how you picked just 4-that dusky blue is stunning! I just love your swatches!!! 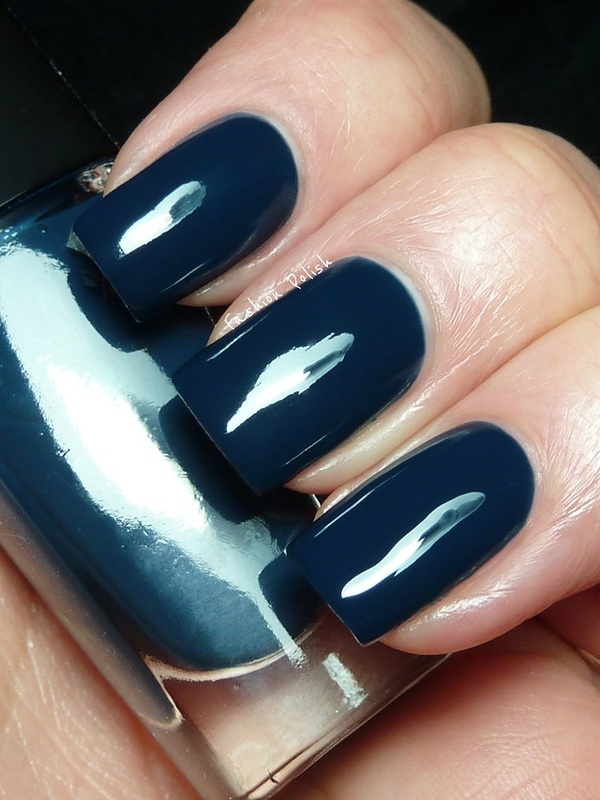 That dark blue one is my favorite from these <3! the prices are sick for the quantity!! !